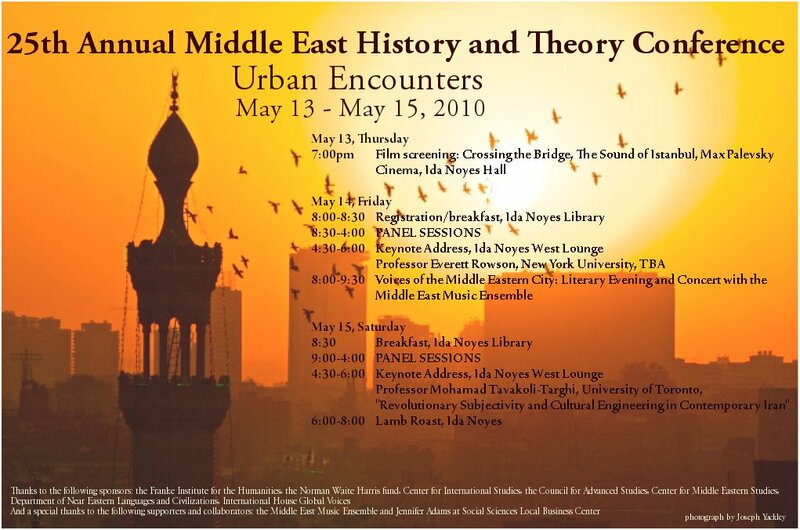 This year, the Middle East History and Theory (MEHAT) Conference is celebrating its twenty-fifth year as a leading forum for emerging scholars in Middle East Studies. The MEHAT Conference is an opportunity for University of Chicago graduate students to share their research with other students and professors from universities within the U.S. and abroad. Interdisciplinary in nature, MEHAT attracts participants from various departments including: Near Eastern Languages and Civilizations, Anthropology, History, Political Science, Economics, Linguistics, Philosophy, Comparative Literature and Religion, Art History, and Film Studies. In the past, participants have traveled from Turkey, Pakistan, France, Germany, and other leading universities from across the United States in order to present their work. Genies as Companions of the Prophet? Supernatural hadith transmitters and post-classical hadith transmission. ‘It’s the economy, stupid’: al-Tabari’s analysis of the free rider problem in the Abbasid caliphate.